Earth's Best is honestly one of my favorite baby product companies! I use at least one of their products every day! 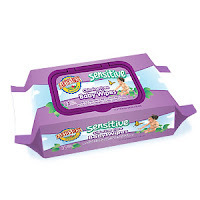 Today I am so excited to feature their new Sensitive Chlorine Free Baby Wipes! My son's skin is really sensitive and I expect my newborn daughter's skin to be no different...especially since she will be a newborn! :) Newborn babies' skin is so thin and really absorb everything that touches their skin! That is why it is so important to only put safe, chemical free and unscented products on your child...whether it is diapers, lotions, or wipes! I don't trust too many baby companies these days because of all the icky and harmful ingredients out there in baby products, but Earth's Best is definitely at the top of my list for one of the best, safest, and most eco-friendly and natural products out there for our most precious people - our children! Buy It: You can purchase the new Sensitive Chlorine Free Baby Wipes at many local retailers. I will have to keep an eye out for these. Thanks.